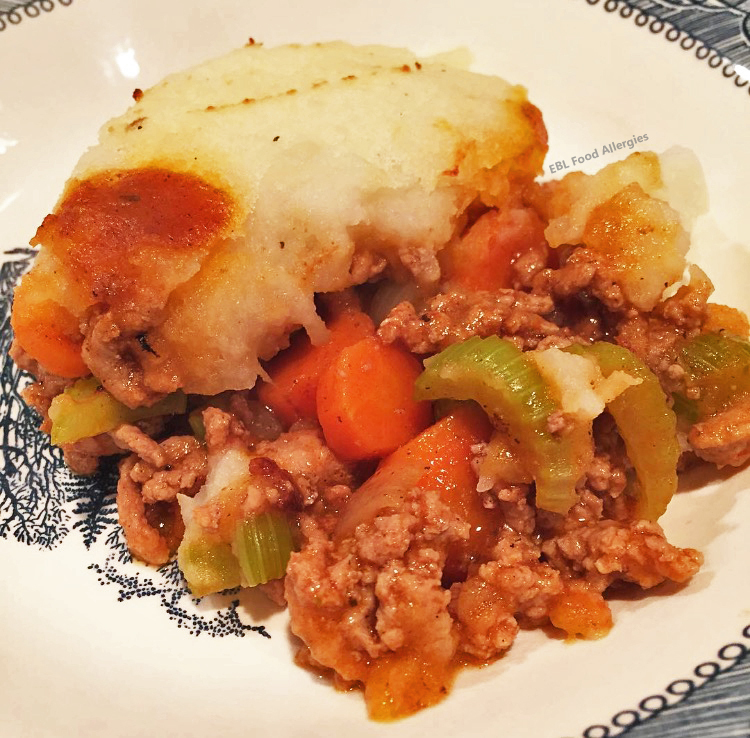 A new twist on an old favorite, Allergy Friendly Shepherd’s Pie! I made this tonight with a few tweaks! I omitted the red wine and garlic, added 1 lb. of ground turkey (my little man needs protein), only used 1 cup of broth, and omitted the mushrooms (my oldest hates mushrooms). Oh, I also totally cheated on the mashed potatoes and bought the microwaveable frozen mashed. Sooooo much easier. Instead of you attempting to figure out what I actually did, I’ll write it all out for ya. Aren’t I sweet? Cook the ground turkey in a large pan over medium heat with 1 Tbsp oil for approx 5-7 minutes or until no longer pink. Remove turkey and set aside. Microwave the Steam n’ Mash potatoes for 10 minutes, following direction on the bag. Cook all the veggies in the same pan over medium heat with 1 Tbsp oil until cooked. Add the turkey back to the pan. Add the tomato paste, flour, and spices mixing well. Slowly add the broth while constantly stirring. Simmer 3-5 minute to thicken. Prepare the mashed potatoes by adding them to a large bowl and mixing oil, rice milk, salt and pepper to taste. Empty the turkey & veggie mixture into a casserole dish and top with the prepared mashed potatoes. Broil for 10-15 minutes, watching carefully so that it doesn’t burn! Like this recipe? Take a look at others HERE that I have shared! This recipe will be added to our rotating menu for sure! Hopefully next time I can make a nicer pic! Loved this recipe! I’m really bad at following directions (don’t tell my wife I admitted that) and this was a really simple recipe. I would recommend it to Dads trying to help their wives out with dinner some night. It was delicious!!! !